The poor revolutionary Bobby Strong (Robby Eisentrout) and the rich tycoon’s daughter Hope (Mara Abramson) are in love. Now before I get anybody in trouble, I want to clearly state: the boys’ bathroom, while not the cleanest facility I’ve been in, was not remotely as dirty as you see here. The problem — and for purposes of the publicity shoot this actually was a problem! — was that the bathroom was too clean. So I employed several tricks in post-production to achieve the desired level of skankiness. Today’s publicity shoot for the Pioneer Theatre Guild’s spring musical Urinetown took me deep into the dank, fetid underbelly of our public school system. The dueling stenches (of human waste and industrial cleaning products) forced me to hold my nose more than a few times. (In truth, there weren’t really any stenches, dueling or otherwise. But sometimes photographers just make up interesting backstories.) Even so, I can’t recall a publicity session that turned out any sweeter than this one. Bonus: the dark, gritty, and satirical texture of the show legitimized my use of techniques that might otherwise have constituted Photoshop abuse. Everyone involved — the actors, crew, directors, and producers — did a phenomenal job preparing for the shoot. Everything about it was buttery smooth and efficient. [From the PTG press release:] Nominated for 10 Tony Awards, this groundbreaking contemporary musical comedy has redefined the world of musical theater. URINETOWN satirizes many contemporary issues, and holds the mirror up to society showing us what can happen when a greedy political system has to deal with an ecological crisis. A twenty-year drought causes all restroom activities to be done in public toilets, which are controlled by the government or big business. Strictly enforced laws ensure that people must pay to pee, or else they will be sent to Urinetown where culprits are sent but never return. A new fee hike, instituted by corrupt corporation Urine Good Company, triggers a revolutionary revolt by the poor. This ultimately leads up to a head to head battle between these two opposing forces, but with an ending that will shock and surprise! 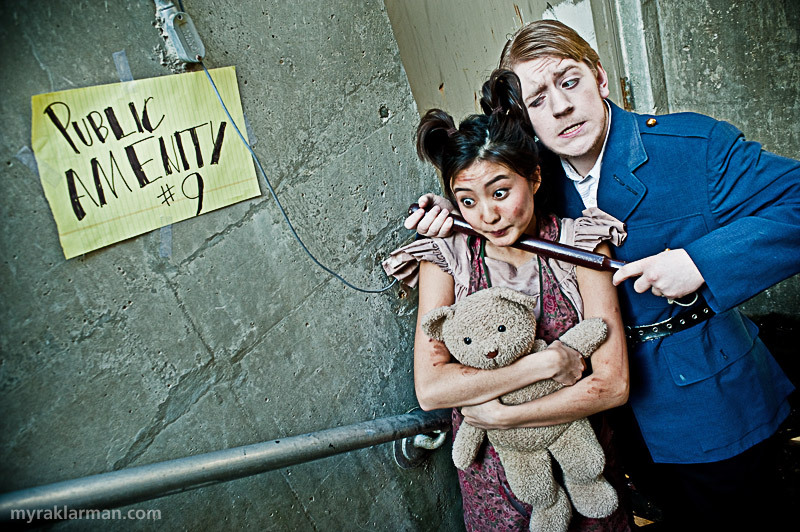 Officer Lockstock (Rory Scott) keeps the street urchin Little Sally (Ashley Park) in line. 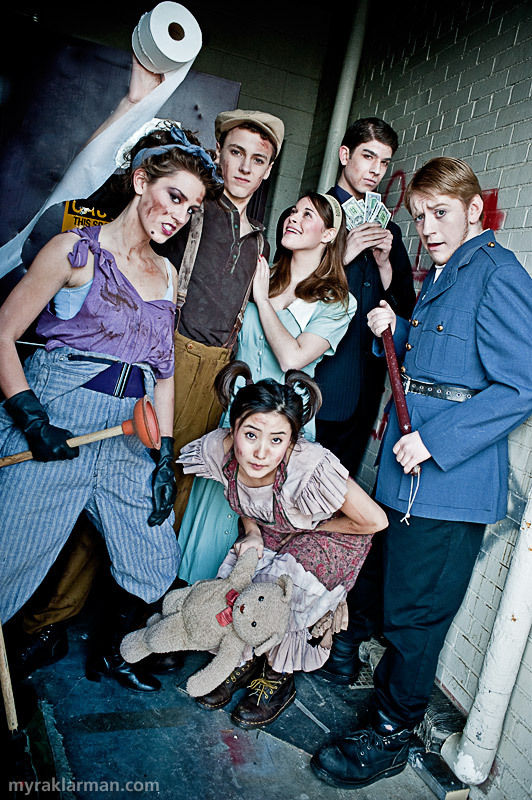 L-R: Penelope Pennywise (Emily Steward), Bobby Strong (Robby Eisentrout), Hope Cladwell (Mara Abramson), Caldwell B. Cladwell (Robert Axelrod), Officer Lockstock (Rory Scott), and Little Sally (Ashley Park). Wow, these pictures are really great. Who knew Pioneer had such good looking students! p.s. these are just fantastic!! wonderful work. i love the processing of the images to go with the feel of the musical.